Edwards Air Force Base, originally known as Muroc Field, is the main test flight center for the US Air Force. It has been used since the 1940's for flight test of advanced aircraft, rocketplanes, and air-dropped aerospace vehicles launched from B-29, B-50, B-52, F-15, 747 or L-1011 carrier aircraft. AKA: Muroc. Status: xRet. 30.04.2000. First Launch: 1931-02-21. Last Launch: 2013-05-01. Number: 385 . Duration: 8.83 days. Location: Edwards AFB, California. Longitude: -117.85 deg. Latitude: 34.97 deg. Apogee: 702 km (436 mi). Minimum Inclination: 51.0 degrees. Maximum Inclination: 145.0 degrees. Edwards AFB is home to the Air Force Flight Test Center. In addition to its role in military flight testing and providing a landing strip and facilities for NASA's Space Shuttle program, Edwards has also hosted activities that have contributed to the nation's missile programs. Rocketry goes back to pre-World War II days when the California Institute of Technology Guggenheim Aeronautics Laboratory used sites at the location then known as Muroc Army Air Field to test primitive engine designs. In the 1990s, this tradition is carried on by Phillips Laboratory. Experimental Rocket Engine Test Station. In April 1947 Aerojet Engineering Corporation received the contract for the initial set of test stands and the Corps of Engineers received responsibility for design and construction of nontechnical facilities. Construction costs between November 1949 and December 31, 1952, would amount to $5 million. Construction of the technical facilities began in February 1950. As work proceeded, the facility came under the command of the newly formed Air Research and Development Command (ARDC). Test Stand 1-5 received its baptism by fire on February 26, 1952, testing a BOMARC engine from Aerojet Engineering Corporation. Within a week, Test Stand 1-3 withstood the blast from a Navaho missile engine. With the establishment of the Western Development Division (WDD) at Inglewood, California, under Brig. Gen. Bernard A. Schriever in July 1954, the Engine Test Station played an important role in the Air Force's Atlas ICBM program. The first Atlas engine test-firing occurred in November 1954. The G.A. Fuller Construction Company received a contract in 1955 for another test stand, and in 1956, the ALCO Company completed construction on a Missile Assembly Building. With the addition of more testing facilities, "captive testing" of Atlas, Thor, and other missile propulsion systems continued through the 1950s. The tests were mostly successful. However, an Atlas missile explosion on March 27, 1959, destroyed Test Stand 1-A. At the time of the Atlas mishap, experiments using small 2.75-inch thick rockets were demonstrating the feasibility of launching missiles from underground silos. The testing expanded to launch one-third scale and then full-scale tethered Minuteman missiles from underground silos. On September 15, 1959, the first of eight full-scale tethered launches used a Minuteman ICBM with a partially charged first stage and dummy second and third stages. With the missile attached to a 2,000-foot nylon cable, the feasibility of silo launching was demonstrated. The successful testing significantly contributed to decisions about how and where to deploy Minuteman missiles. Also in 1959, the Wright Air Development Center transferred responsibility for rocket propulsion development to the Air Force Flight Test Center (AFFTC). Four years later, the test stands and associated facilities at Edwards were designated the Rocket Propulsion Laboratory (RPL). Rocket boosters for missiles, spacecraft, and military satellites continued to be tested through the end of the Cold War and beyond. In 1987, RPL was redesignated the Astronautics Laboratory. On December 13, 1990, the Astronautics Laboratory was merged into a larger research organization. This new organization, Phillips Laboratory, combined the assets of four Air Force research facilities. Although headquartered at Kirtland AFB, New Mexico, Phillips maintains an active presence at Edwards at former Astronautics Laboratory facilities. Edwards AFB DZ Air-launched rocket drop zone known to have been used for 3 launches in 1959, reaching up to 117 kilometers altitude. Palmdale Omni DZ Air-launched rocket drop zone. Delamar Dry Lake DZ Air-launched rocket drop zone. RW00/18 on the dry lake was also used for emergency landings. Cuddeback Dry Lake DZ Air-launched rocket drop zone known to have been used for 1 launch in 1965, reaching up to 21 kilometers altitude. RW01/19 on the lake was also used for emergency landings. Railroad Valley Lake DZ Air-launched rocket drop zone known to have been used for 2 launches in 1968, reaching up to 81 kilometers altitude. Hidden Hills DZ Sounding rocket launcher site. Also used as air-launched drop zone, with runway RW14/32 serving as emergency landing strip. Mud Lake DZ Sounding rocket launcher site. Air-launched drop zone, with RW08/26 and RW18/36 available for emergency landings. Silver Lake DZ Air-launched rocket drop zone. RW15/33 used for emergency landings. Smith Ranch Lake DZ Air-launched rocket drop zone. RW03/21 used for emergency landings. Family: Orbital Launch Site. Country: USA. Spacecraft: XS-1, D-558-2, Enterprise, Columbia, X-38. Launch Vehicles: X-15, X-51A, Navaho X-10, Atlas A, Minuteman 1A, Space Shuttle, X-51A, ALSOR. 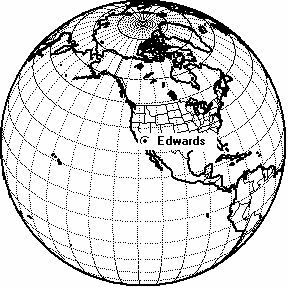 Launch Sites: Edwards RW04/22, Edwards TL1, Edwards AFB DZ, Edwards TL2, Edwards RW18/36. Agency: USAF. Bibliography: 2, 13403. 1948 February 4 - . Launch Site: Edwards. Launch Complex: Edwards. D-558-II first flight. - . Crew: Martin, John F. Nation: USA. Related Persons: Martin, John F. First flight of reseach airplane Douglas D-558-II (No. 1), John Martin of Douglas as pilot. Airplane had both jet and rocket engines and was flown from ground takeoff..
1951 November 9 - . Launch Site: Edwards. Launch Complex: Edwards. XS-1 No. 3 destroyed in ground explosion. - . Crew: Cannon. Payload: XS-1 # 3 flight 1. Nation: USA. Related Persons: Cannon. Class: Manned. Type: Manned rocketplane. Spacecraft: XS-1. Planned captive flight with B-50 for propellant jettison test. XS-1 (No. 3) rocket research airplane and its B-29 "mother" airplane were destroyed on the ground by postflight explosion and fire. Pilot Cannon was injured..
1956 June 21 - . Launch Site: Edwards. Launch Complex: Edwards. LV Family: Atlas. Launch Vehicle: Atlas A.
Atlas ICBM first test firing - . Nation: USA. First captive Atlas first test firing. The 'battleship' missile was installed at test stand 1-4, Edwards Air Force Base. The test was a failure due to inadvertant closure of the fuel prevalve, leading to duct collapse, and a turbine overspeed cutoff. No damage was sustained and the first successful firing came the next day. Atlas, First successful captive test firing, June 22, 1956, Edwards Rocket Base, duration - 4 seconds. Successful. 1956 August 27 - . Launch Site: Edwards. LV Family: Thor. First static test firing of Thor engine. - . The first static test firing of a Thor engine was conducted at the rocket engine test facilities at the Air Force Flight Test Center (AFFTC), at Edwards AFB, California..
1956 September 28 - . Launch Site: Edwards. LV Family: Atlas. Launch Vehicle: Atlas A.
Atlas missile 2A delivered to Edwards AFB - . Atlas missile 2A was accepted by the Air Force and delivered to Edwards AFB, Test Stand 1-A, for checkout prior to captive test firings scheduled for early 1957..
1959? - . Launch Site: Edwards. Launch Complex: Edwards AFB DZ. Launch Pad: 34.9 N x 117.8 W. Launch Platform: F-104. LV Family: Deacon. Launch Vehicle: ALSOR. Model A (F1) test - . Nation: USA. Agency: NASA. Apogee: 74 km (45 mi). Air dropped in Edwards AFB DZ..
Model A (F2) test - . Nation: USA. Agency: NASA. Apogee: 117 km (72 mi). Air dropped in Edwards AFB DZ..
NOTS Viperscan test - . Nation: USA. Agency: NASA. Apogee: 71 km (44 mi). Air dropped in Edwards AFB DZ..
1962 November 29 - . Launch Site: Edwards. LV Family: Titan. Launch Vehicle: Titan IIIC. Edwards AFB solid-rocket motor test facility. - . Ground was broken at Edwards AFB, California for construction of the largest and most heavily instrumented solid-rocket motor test facility. It was designed to test the five-segment, 120-inch solid-propellant motors for the Titan III program but could handle engines up to and including 156 inches in diameter. 1964 December 22 - . Launch Site: Edwards. LV Family: Titan. Launch Vehicle: Titan IIIC. Development of Titan III solid-rocket motor completed - . United Technology Center (UTC) successfully fired its 120-inch diameter, one million-pound thrust, solid-propellant rocket motor at Edwards AFB. This was the fourth static test firing of the motor within two months, and it completed the development phase of the Titan III solid-rocket motor (SRM) program. 1967 November 15 - . Launch Site: Edwards. Death of Michael James 'Mike' Adams at Edwards AFB, California, in crash of X-15 Flight 191. - . Nation: USA. Related Persons: Adams. American test pilot astronaut 1965-1966. Spacecraft went out of control during reentry. 1 suborbital spaceflight on the X-15, 0.1 hours in space..
1972 December 14 - . Launch Site: Edwards. The Operations and Maintenance functions of the 6592d ABG were transferred to Edwards AFB, California. - . The Operations and Maintenance functions of the 6592d ABG were transferred to Edwards AFB, California..
1979 March 8 - . Launch Site: Edwards. Launch Complex: Edwards. Columbia (OV-102) transported overland to Edwards. - . Nation: USA. Program: STS. Class: Manned. Type: Manned spaceplane. Spacecraft Bus: Shuttle. Spacecraft: Columbia. Columbia (OV-102) transported overland from Palmdale to Edwards (38 miles). 2010 May 26 - . 10:10 GMT - . Launch Site: Edwards. Launch Complex: Edwards TL1. Launch Platform: B-52H. LV Family: ATACMS. Launch Vehicle: X-51A. Nation: USA. Apogee: 19 km (11 mi). Air dropped in Point Mugu Drop Zone..
2011 June 13 - . Launch Site: Edwards. Launch Complex: Edwards RW04/22. Launch Platform: B-52H. LV Family: ATACMS. Launch Vehicle: X-51A. Nation: USA. Agency: USAF RL. Air dropped in Point Mugu Drop Zone..
2012 August 14 - . 18:35 GMT - . Launch Site: Edwards. Launch Complex: Edwards RW04/22. Launch Platform: B-52H. LV Family: ATACMS. Launch Vehicle: X-51A. 2013 May 1 - . Launch Site: Edwards. Launch Complex: Edwards RW04/22. Launch Platform: B-52H. LV Family: ATACMS. Launch Vehicle: X-51A.